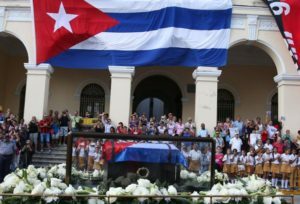 Somos+, Arlenys Miranda Mesa, 4 December 2016 — Nine days of national mourning have been decreed for the death of Fidel Castro. Fidel has died, but it seems like he is still alive. However, we who are alive, it seems we are dead. There are many ways one can be dead and not only physically or spiritually because of sin, as God says in his Word. From the moment we whisper to express what we believe or because we don’t want any trouble, denouncing the injustices that are committed daily in Cuba, we can talk about the death of the conscience. Today I took my younger son to Gerardo Domenech School, located in Jovellanos, Matanzas, Cuba, and I found that they didn’t ring the bell, because they haven’t had any electricity since yesterday. I approached one of the teachers and asked how they could hold class in classrooms without light. Maybe they don’t know that the low light is affecting our children’s vision and this will affect them for life because they are in the midst of their development. I asked, then, “Why hasn’t the fault been fixed?” She explained to to me that it’s not a fault, but that the school has a determined amount of kilowatts assigned to it for each month and when that is used up then there isn’t any more. She told me about the efforts to save electricity, and that includes they themselves turning off the lights, but it still isn’t enough and doesn’t last and that from now until December 5th there won’t be any more kilowatts assigned. “What am I going to feed my children, how can I stretch my income, when I have to get a transurethral resection (RTU) for my dad who has spent two months with probes but his urethra is obstructed, and we already went to the National Hospital, the Naval Hospital, Oncology and they couldn’t do it, because the equipment for the procedure is broken. “From Oncology they sent to the Almejeiras Brothers Hospital, and without going into the details, they saw us, and for more than 15 days we have been waiting for the miraculous phone call that says: Come to the hospital. “How can I guarantee that my children can study in a university and that they can become what they want, and not have some career determined by someone else? How do I resolve the problems in some of the stores where they change the prices of the products, or they don’t label them and you have to ask the clerks one by one, as happened to me in the Varadero Airport? “How do I know what I’m buying in the state stores are industry made products and not handmade as has happened? Note: In the Naval Hospital they only see military and their families. My father is seen as a combatant who already lost his hands in a detonator explosion, during maneuvers by the Territorial Troop Militias (MTT), preparing for ‘the war in a time of peace’ in the year 1996. *Translator’s note: Since Fidel Castro’s death the government has set up gathering points all over the country where Cubans are asked to come and sign a loyalty oath to his Revolution.